Breathe easy, knowing that you can track and sense the quality of the air around you with the PM2.5 Air Quality Sensor with Breadboard Adapter particulate sensor. Mad Max & Furiosa definitely should have hooked up one of these in their truck while scavenging the dusty desert wilderness of post-apocalyptic Australia. And for those of us not living in an Outback dystopia, this sensor + adapter kit is great for monitoring air quality, and super easy to use! WITNESS real-time, reliable measurement of PM2.5 dust concentrations! (PM2.5 refers to particles that are 2.5 microns or smaller in diameter.) 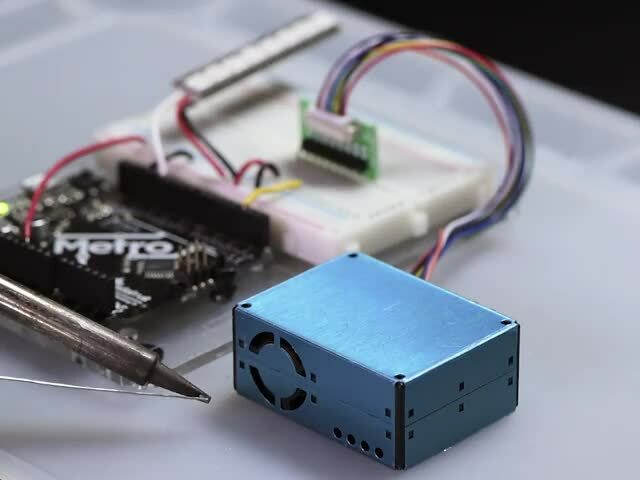 This sensor uses laser scattering to radiate suspending particles in the air, then collects scattering light to obtain the curve of scattering light change with time. The microprocessor calculates equivalent particle diameter and the number of particles with different diameter per unit volume. This guide was first published on Dec 27, 2017. It was last updated on Dec 27, 2017. This page (Overview) was last updated on Apr 24, 2019.